SURIGAO, PHILIPPINES - The sunken remains of five Japanese and two U.S. warships — including the vessel that fired the first American shot of World War II — have been found off the Philippines, a team of deep sea explorers funded by billionaire Microsoft co-founder and philanthropist Paul Allen have announced. Released earlier this week, ahead of the anniversary of Japan’s attack on Pearl Harbor on Dec. 7, 1941, underwater footage shows one of the ships is the USS Ward, the destroyer that fired the first American shot in the war on the morning of the surprise attack, just outside Pearl Harbor. Its second shot sank a Japanese midget submarine. Briefing reporters Thursday aboard the research vessel Petrel, docked in the port city of Surigao on the northernmost tip of Mindanao island, the team also presented images of what are believed to be wrecks of the Japanese warships Yamashiro, Fuso, Yamagumo, Asagumo and Michishio, which were found between Nov. 22 and 29 on the Surigao Strait seabed. The five were among seven Imperial Japanese Navy vessels that took part in the Battle of Surigao Strait from late Oct. 24 until before sunrise on Oct. 25, 1944. After discovering the Japanese vessels, the survey mission proceeded to nearby Ormoc Bay, where it found the wreckages of the USS Ward and USS Cooper in waters some 250 meters deep. On Dec. 7, 1944, the Ward, a Wickes-class destroyer, was patrolling Ormoc Bay and acting as a high-speed troop transport when it was struck by a kamikaze attack, and the crew was told to abandon ship, the team said. “The USS Ward found herself in the crucible of American history — at the intersection of a peacetime Navy and war footing,” Adm. Scott Swift, commander of the U.S. Pacific Fleet, was quoted by the team’s press release as saying. “The Surigao Strait is a very confined area, so the historical records and the actual reports of that battle are fairly accurate,” he added. Although greatly outnumbered, the Japanese vessels engaged in a ship-to-ship battle with U.S. and Australian naval forces seeking to wrest control of the Philippines from Japan. “The liberation of the Philippines (in 1945) could not have occurred without the Battle of Leyte in October 1944. The Battle of Surigao Strait was one of the main actions of the overall Battle of Leyte Gulf,” said Jeremy Barns, director of the National Museum of the Philippines, which granted the permit for the survey. According to Jake Miranda, a local historian who founded the Battle of Surigao Strait Museum in Surigao, some 4,000 Japanese combatants perished in the fight. 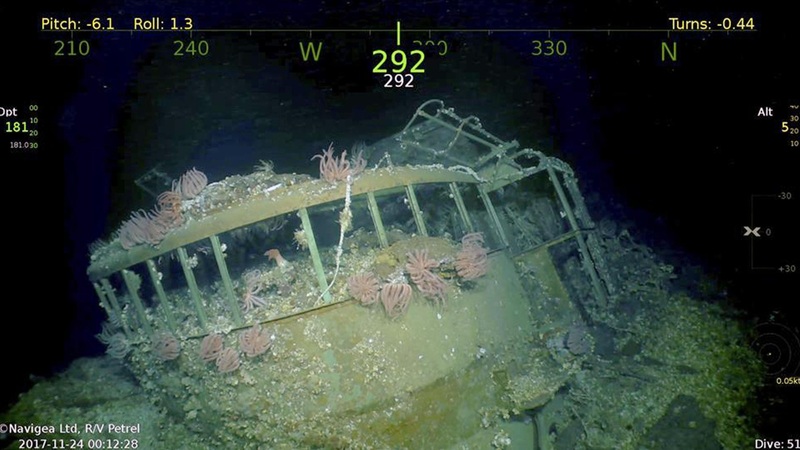 Kraft and lead researcher Paul Mayer told reporters that the Fuso-class dreadnought battleships Yamashiro and Fuso were found upside down, with the former mostly intact and the latter broken. The Asashio-class destroyers Asagumo and what was believed to be the Michishio were found intact, while what was suspected to be the Yamagumo, a destroyer of the same class, was broken into two pieces as it underwent a violent explosion before sinking. Mayer said the two wrecks believed to be the Yamagumo and Michishio, which were 2 km apart at the same latitude, were found in shallower areas of just above 100 meters deep. The research team explained they could not ascertain positive identification of the Yamagumo and Michishio due to their identical features. The three other vessels were submerged at a depth of some 200 meters. “The ships are in very poor condition, obviously, because of what happened to them. And the overgrowth is very prolific. They now provide a fantastic marine habitat,” Kraft said, adding that rust was visible. Other images captured included shots of one of the vessels’ 127-mm guns, one of three boilers from a steam turbine propulsion unit and a Japanese sake cup that had a unique plum blossom design. Since the exploration was only external, no interior images of the ships were generated and no remains were found. Mayer said they are willing to provide their data to the National Institute of Defense Studies in Tokyo, and to the Kure Maritime Museum, also known as the Yamato Museum, in Hiroshima Prefecture. Barns, of the National Museum of the Philippines, whose agency is mandated to serve as the custodian and protector of such relics, said the discovery of the warships’ location will provide “a greater sense of closure” to the relatives of those who died in the sinkings. “We hope that the work that we have done is appreciated and that it brings closure so they can finally identify where their loved ones have been lost — that it helps them in some way or comforts them,” Kraft said. Annette Villaces of the Surigao municipal government said although the exact locations of the wrecks will not be publicly released, the confirmation of their existence is expected to boost local tourism. 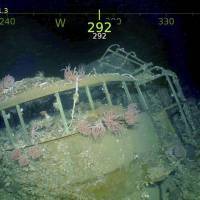 In March 2015, Allen’s team discovered the wreck of the legendary Japanese battleship Musashi in the Sibuyan Sea off the central Philippine province of Romblon. The 263 meter-long, 73,000-ton Musashi, said to be one of the largest and most technologically advanced battleships, was sunk by U.S. forces on Oct. 24, 1944, as it was about to participate in the Battle of Leyte Gulf. More than 1,000 sailors died in the sinking. The 250-foot Petrel is manned by some 35 personnel and is equipped with advanced technology, mainly a remotely operated vehicle, to explore the sea to depths of as much as 6,000 meters.